Zero to Funk in one click! 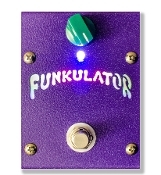 The Funkulator Bass Tone Shaper gives you great slap tone quickly and easily! Special EQ contour is great for any style of playing. Simply dial in as little or as much as you want.